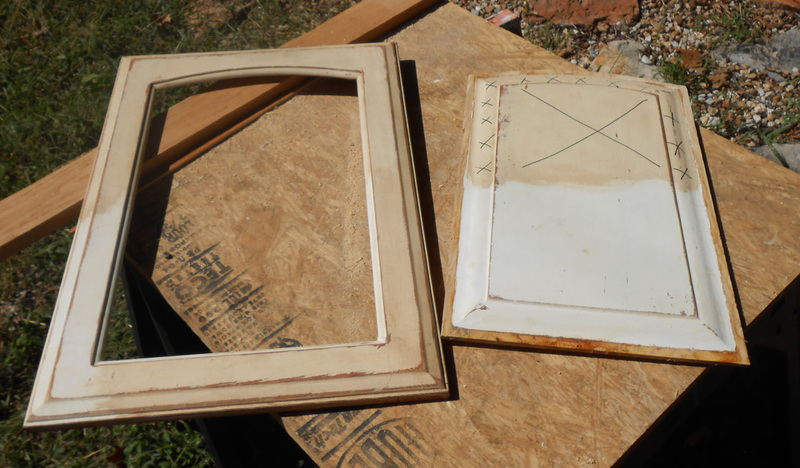 I found a great article here about the step-by-step process of converting solid cabinet doors to glass. 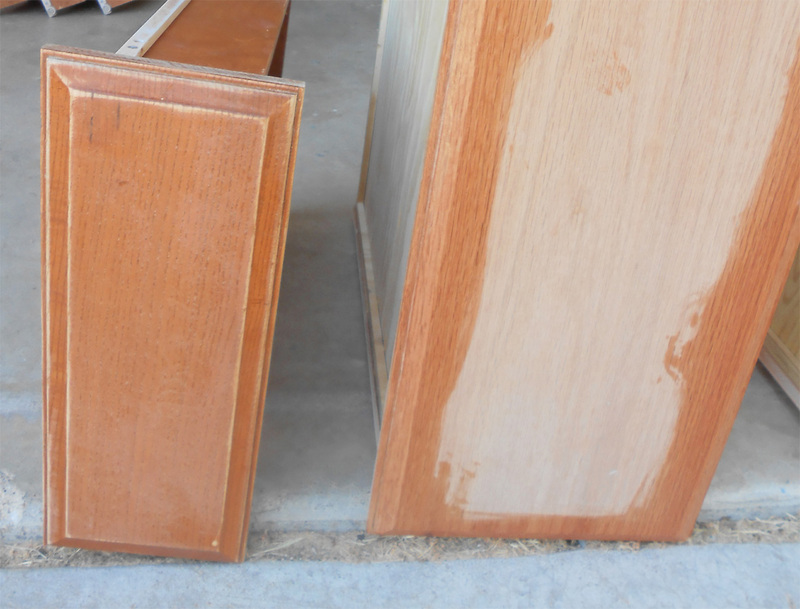 We lucked out and our cabinet doors were panel doors. 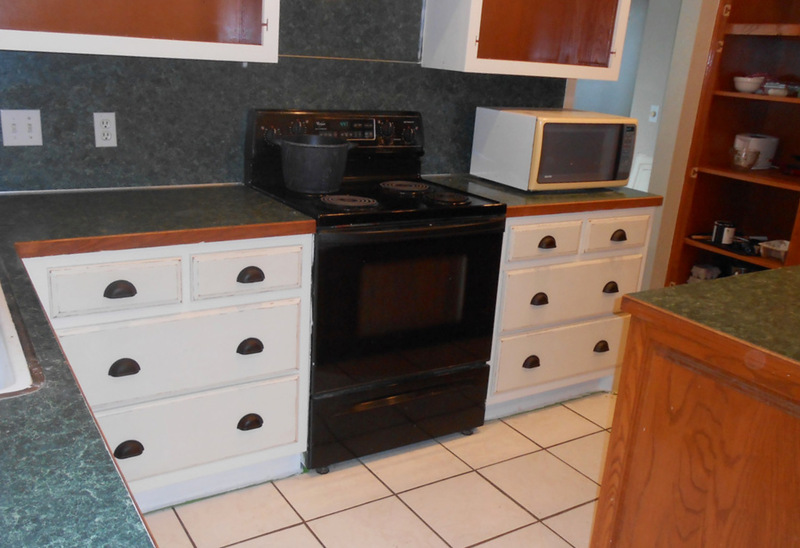 In the long run, this saved us some substantial money as we were able to change the look of our kitchen without paying a carpenter! 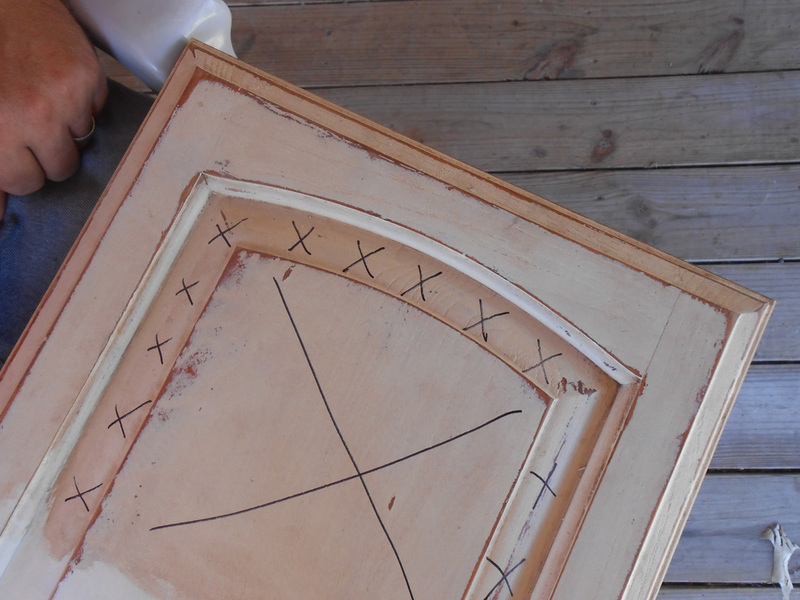 Like I’ve written before always do a test door before proceeding with your actual cabinets. 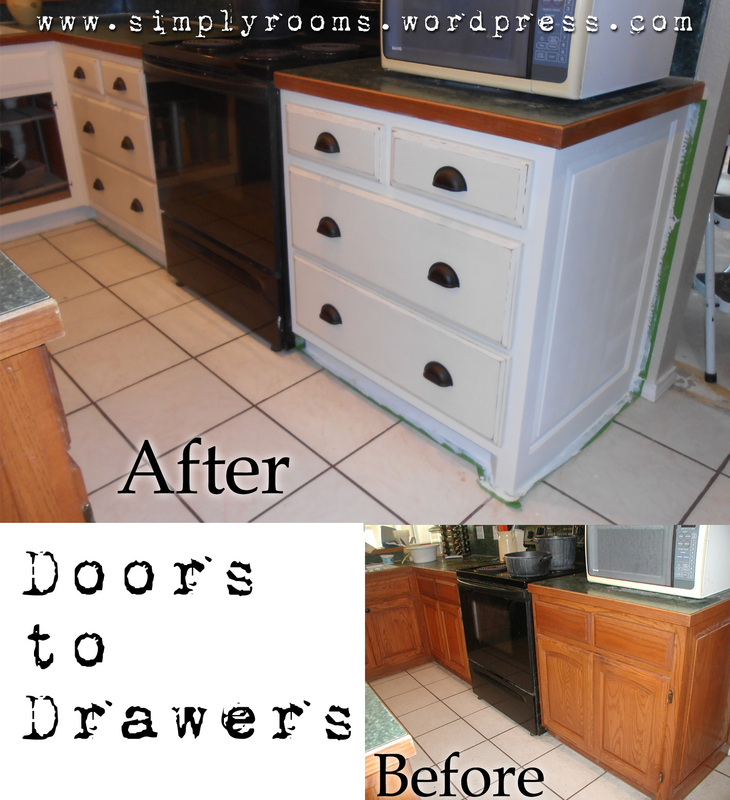 I had several cabinet doors I was removing for good (converting to open cabinetry) so it wasn’t a problem for me. 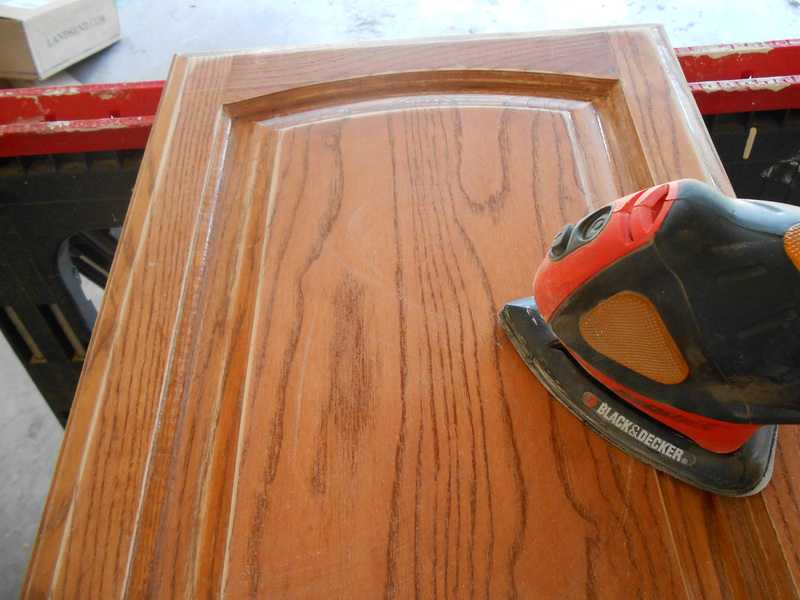 However, if you don’t have a spare door, check out your local Habitat for Humanity’s ReStore where they sell odds and ends for home remodeling for dirt cheap prices. 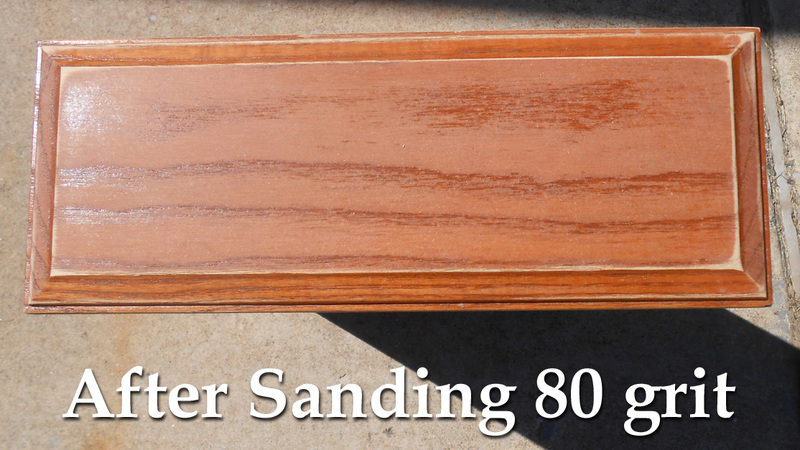 Husband used a router but if you don’t have one, they are available for rental from tool shops. You can also find them used at tool consignment shops, on sale during Black Friday at Home Improvement stores, and off of Craigslist. They have great uses! In the following photos, I marked important areas with a black Sharpie so you could better see what we were doing. 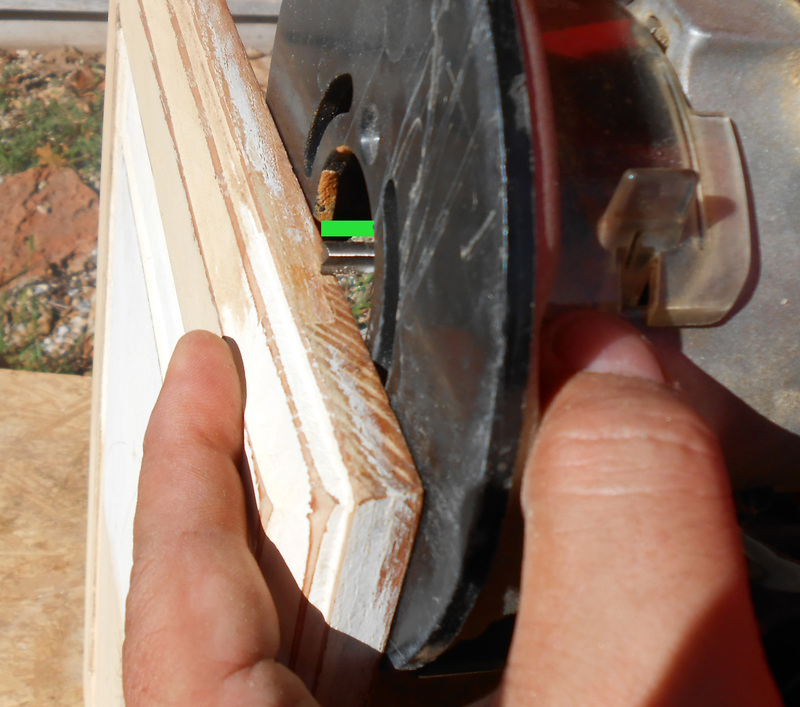 Lime green lines are to show areas of interest.This work is done on the INSIDE of the cabinet door, not the face. 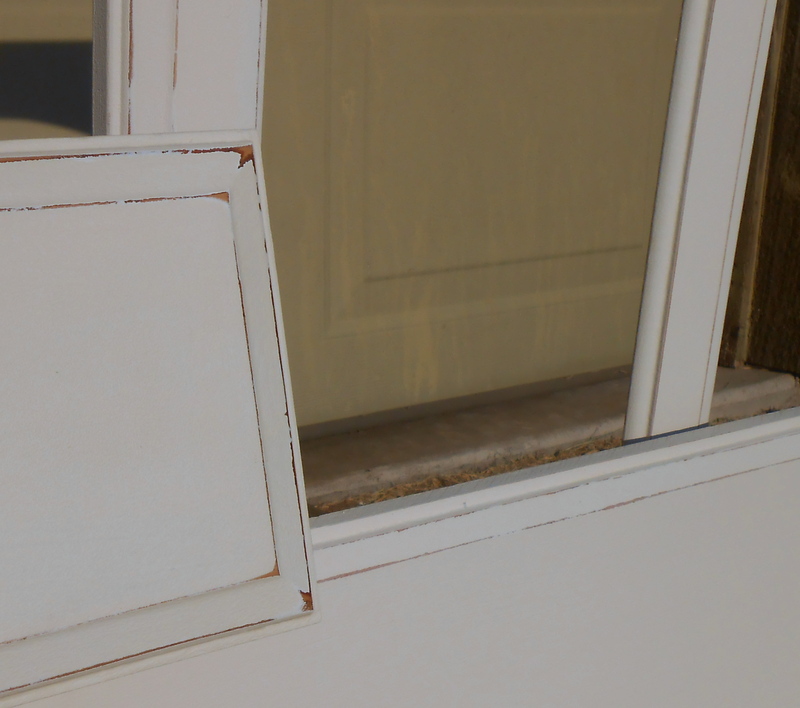 For this DIY experiment, we used the paint test door I made for the kitchen. The areas marked with an X will be removed during this conversion. 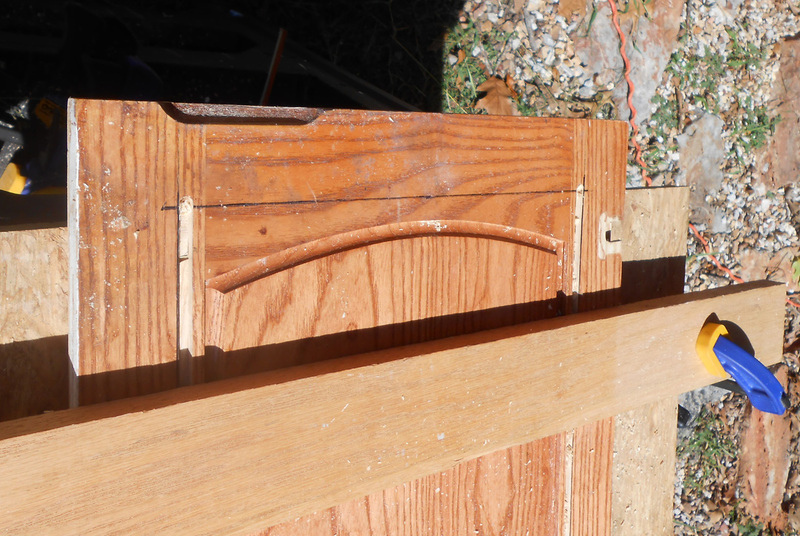 When you look at the door edge you can see where the pieces have been fitted together to make the door. 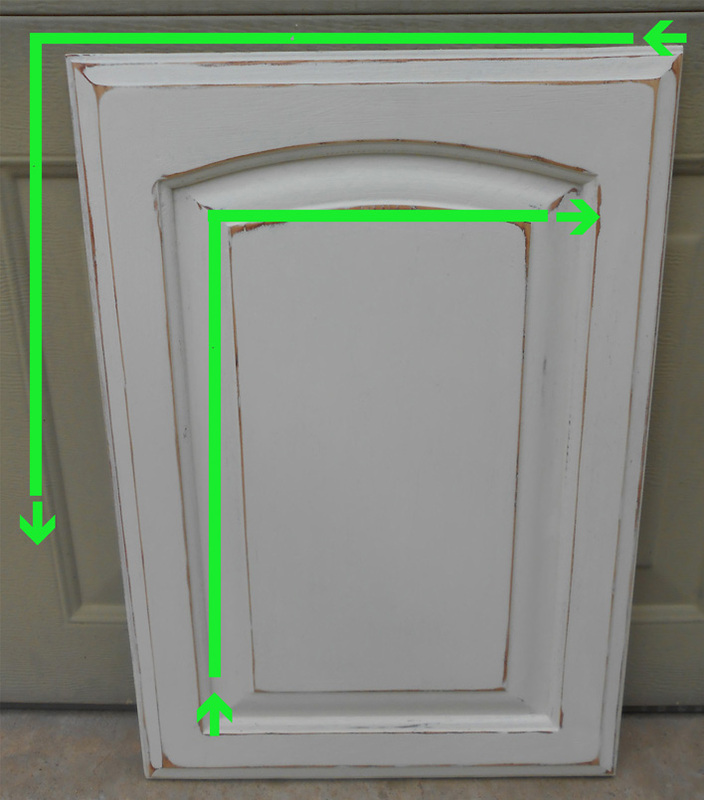 A panel cabinet door is not cut from one piece so it makes it easier to do this conversion. 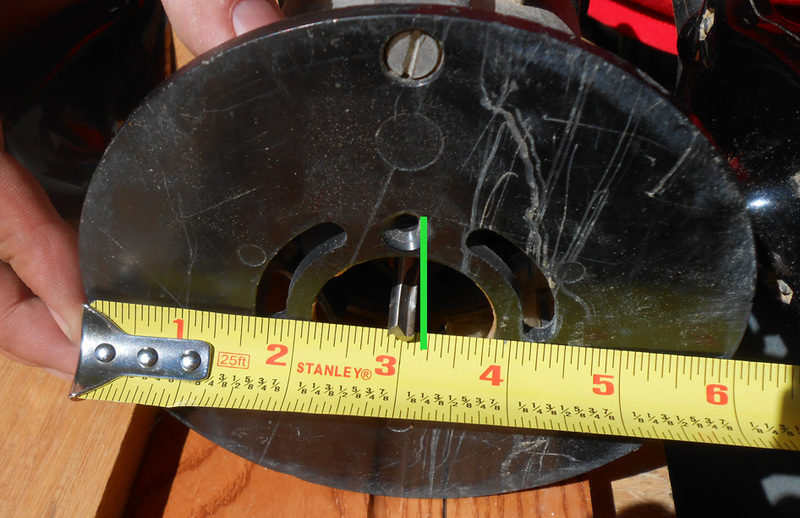 Measuring this area tells you the depth to set your router blade. 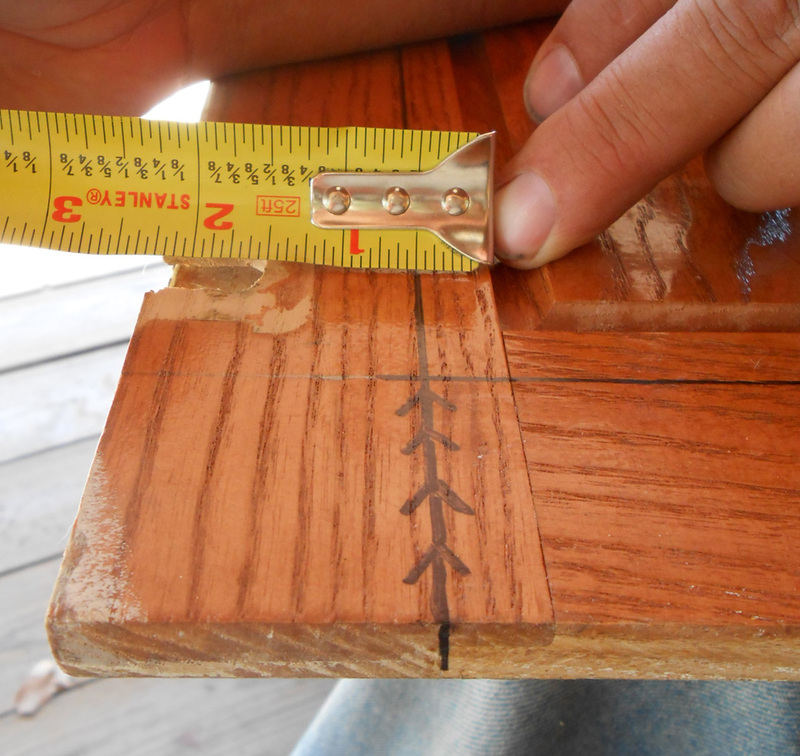 Measuring off this side joint, you can figure the depth of the long cutting line from the edge of the inside of the cabinet door. 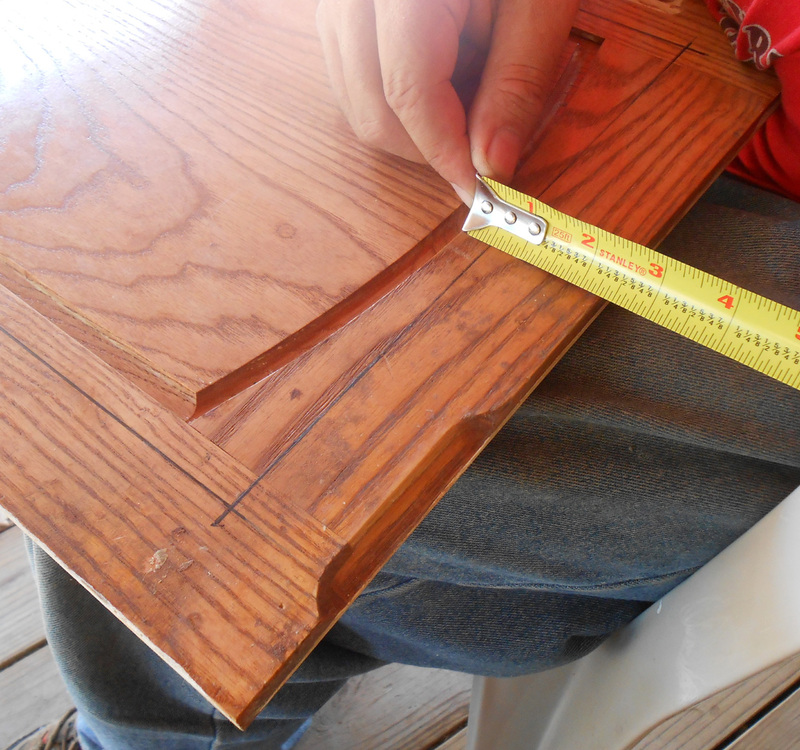 We first measured the longest sides of the cabinet door, the short side, and lastly, the short side with the arch. 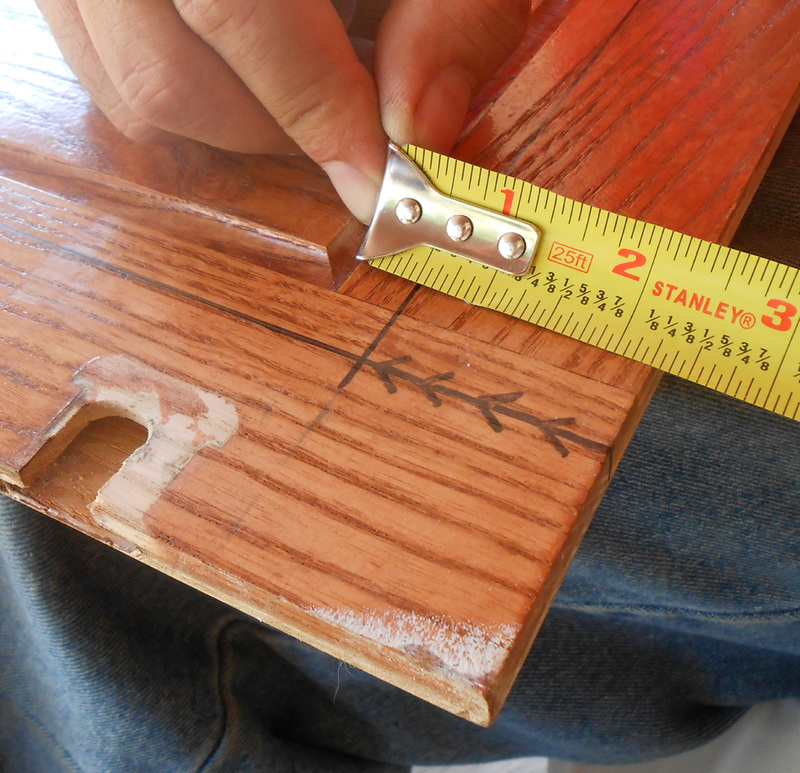 The Guide Board is measured at both ends to match the router edge to blade measurement and is clamped down. 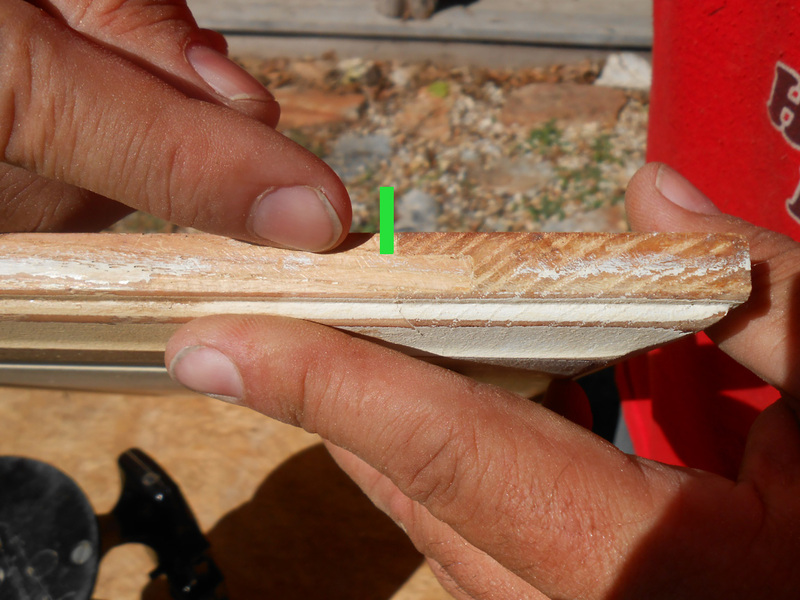 The Guide Board was adjusted after we checked the router blade at the draw cut line. 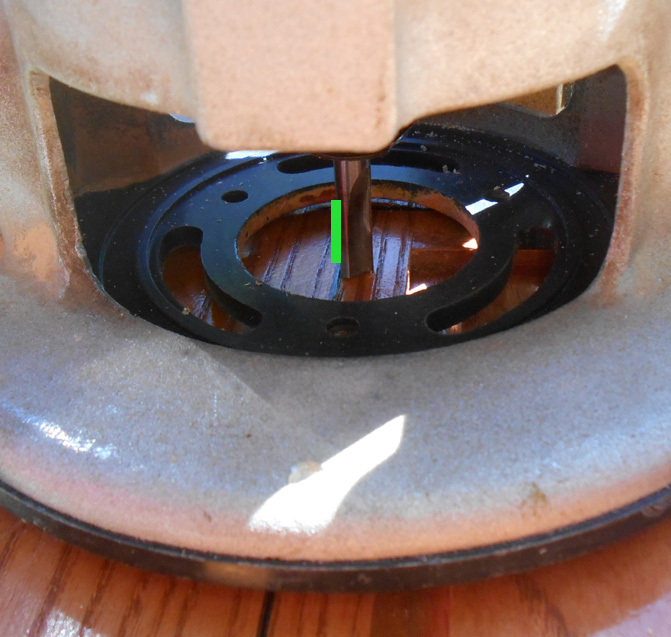 The router blade is sitting on the inside of the cut line and that is where it should be (click photo for a close up view). 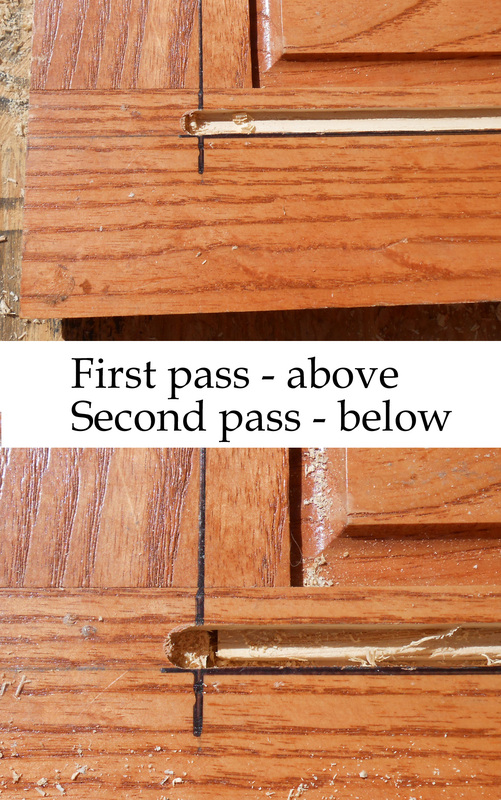 The Router must be moved around the OUTSIDE of a rectangle (or circle) on a COUNTERCLOCKWISE movement. 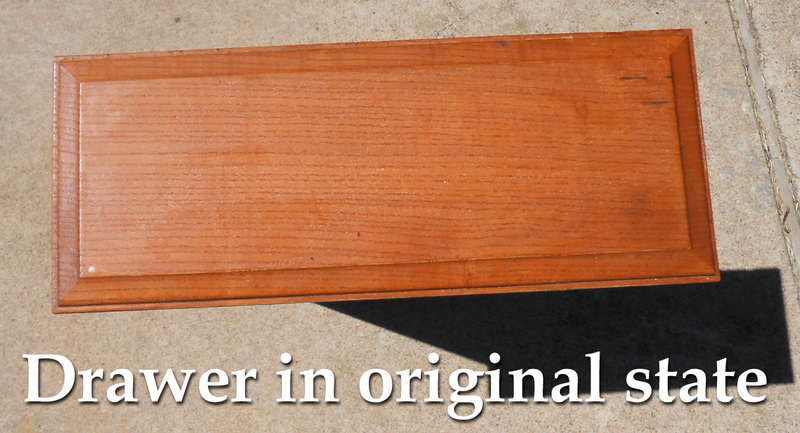 The Router must be moved around the INSIDE of a rectangle (or circle) on a CLOCKWISE movement. 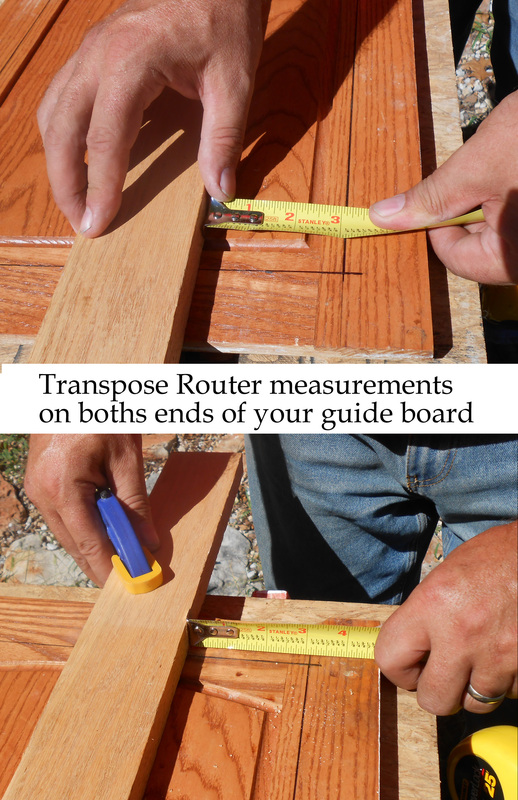 If you goof up that is okay – the above directions just make it easier for the router to cut. The Guide Board is moved when we do the short ends. 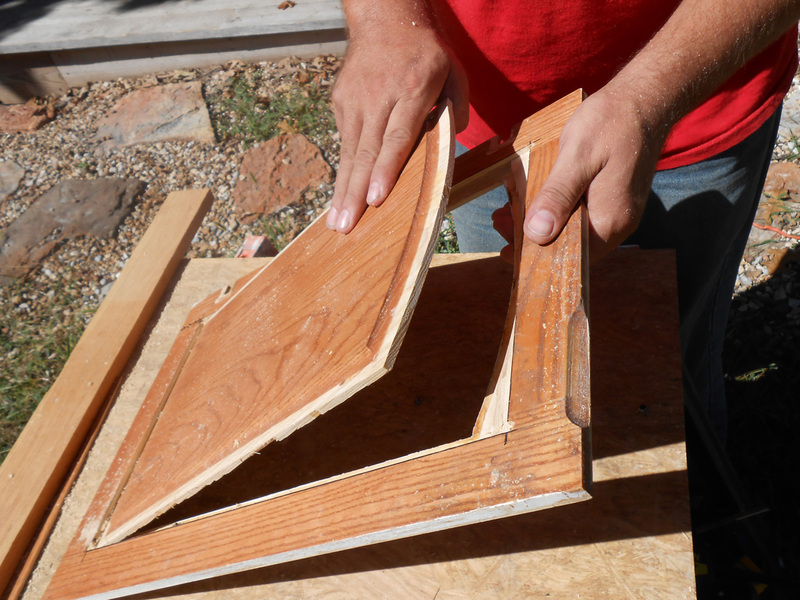 All four sides of the inside of the panel are now cut. 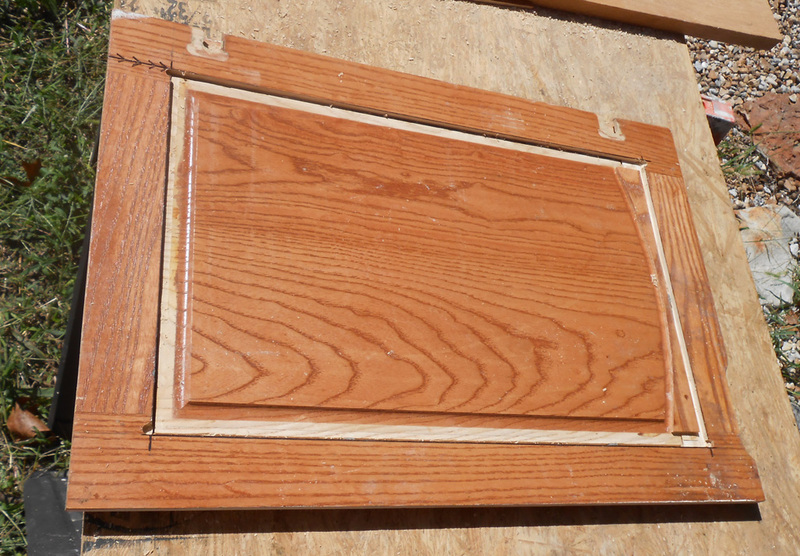 The arch of the panel (on the inside of the door) also needs to be removed. 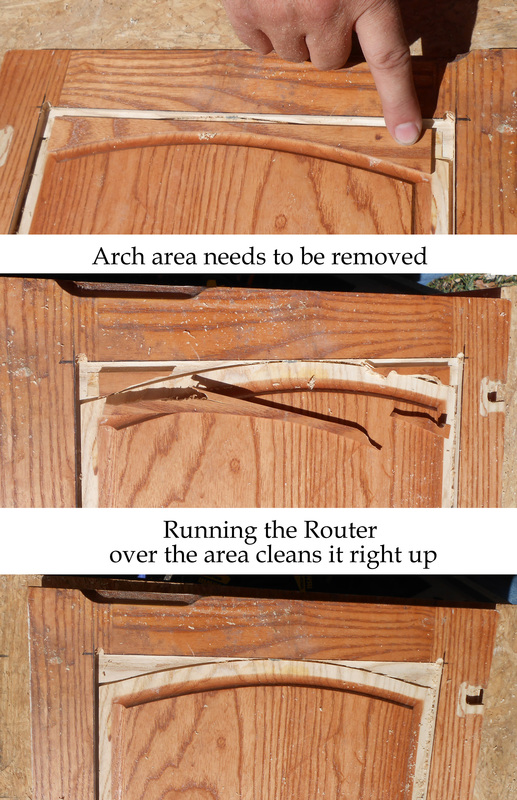 You can do this with your router, by just scrubbing the bits out by running the router against the edges. 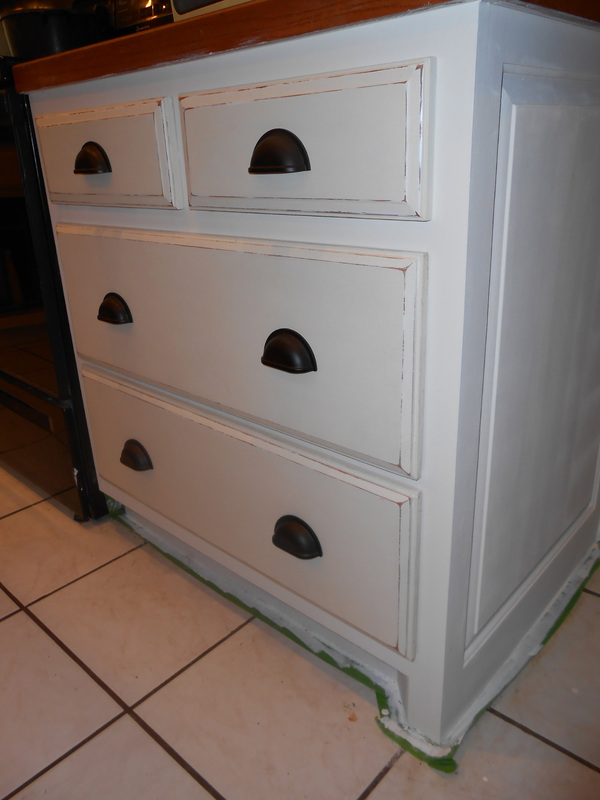 The doors were painted with chalk paint and went from orange oak stain to an off-white and distressed. Glass was installed by Robinson Glass with 4 doors: 9″ x 21″ glass inserts with “seedy” (glass with a slight bubble pattern) at approximately $14.50 each panel ($54 total). 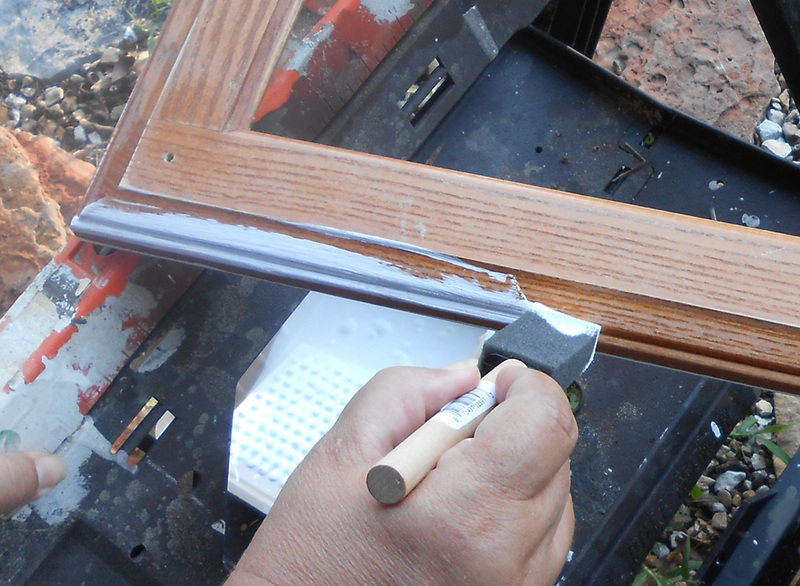 If doing the glass installation yourself, remember to use a clear silicone caulk. 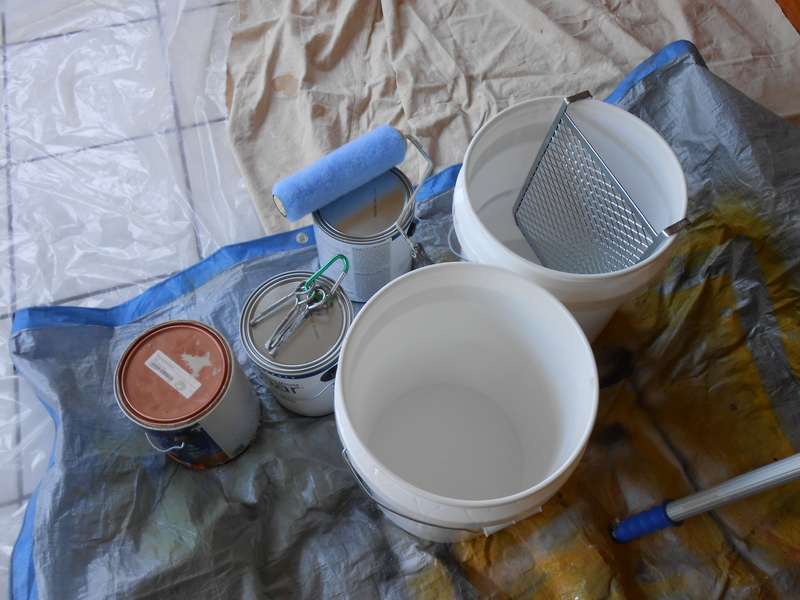 When remodeling a room you should plan on doing the work from the ceiling down when it comes to repairs, painting, installation etc… One major reason for this is painting a ceiling IS messy! Splatter WILL go everywhere. 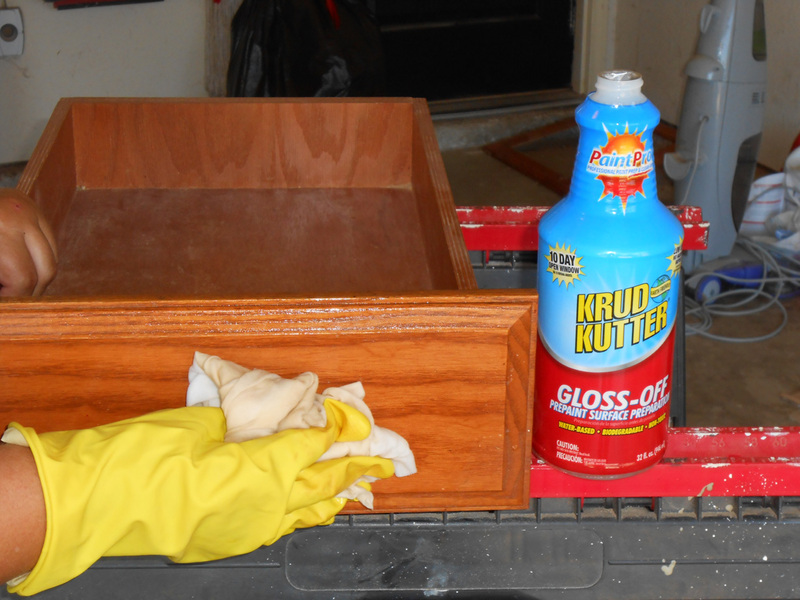 Everything on the floor must be covered, remove what you can, and have a wet rag on hand to immediately clean up drips. 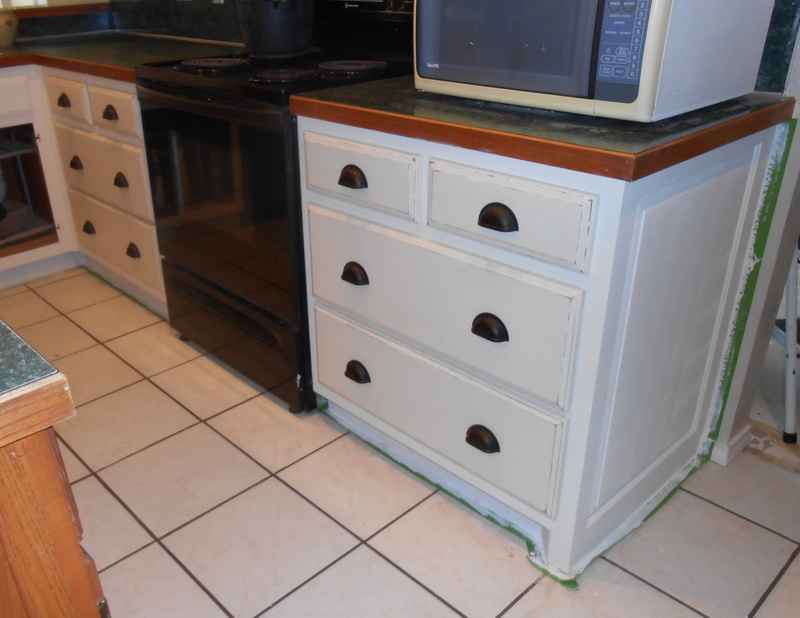 Since I plan on replacing counters and painting the cabinets, I was only concerned about splatter hitting the ceramic floor. 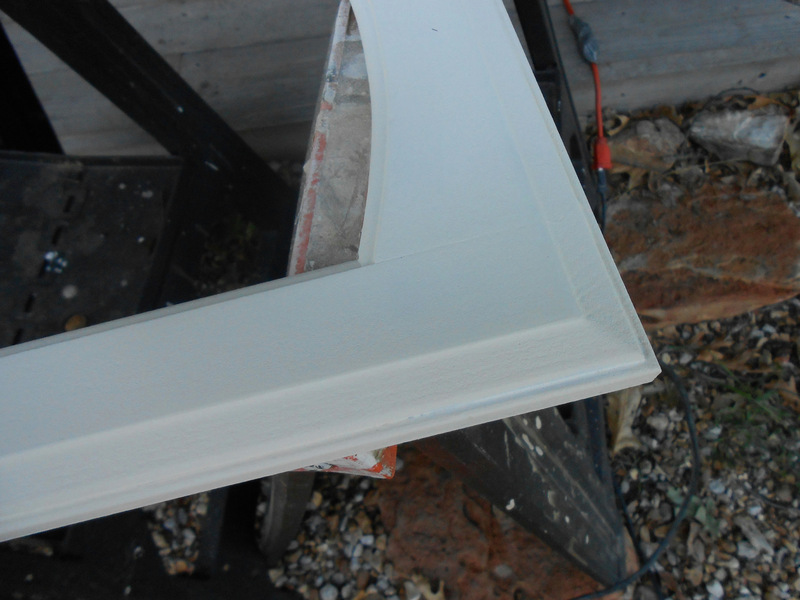 It’s the reason that builders, spray plaster on and paint before the flooring goes it. 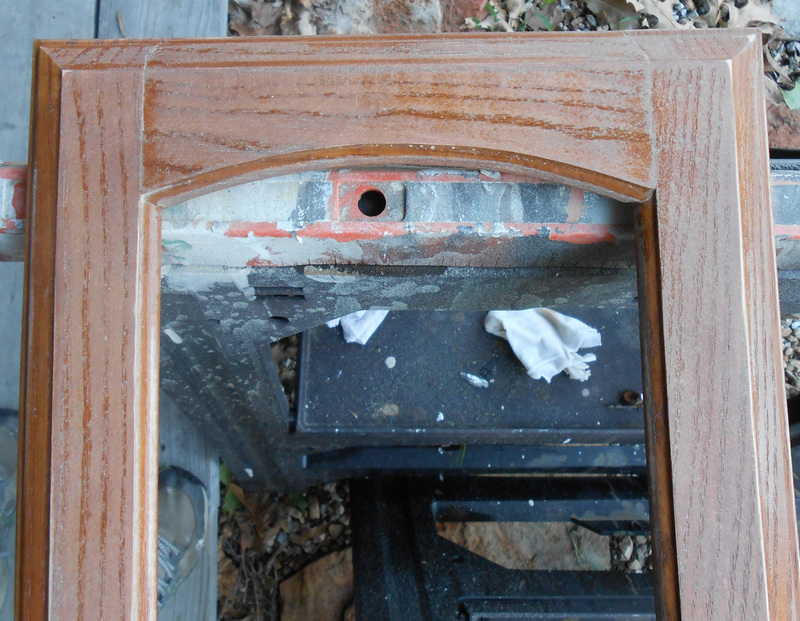 It makes the job go a lot faster and the risk of damaging anything is lessened. Roller, can opener, stir sticks, damp wiping rag for splatters, and lots and lots of dropclothes. 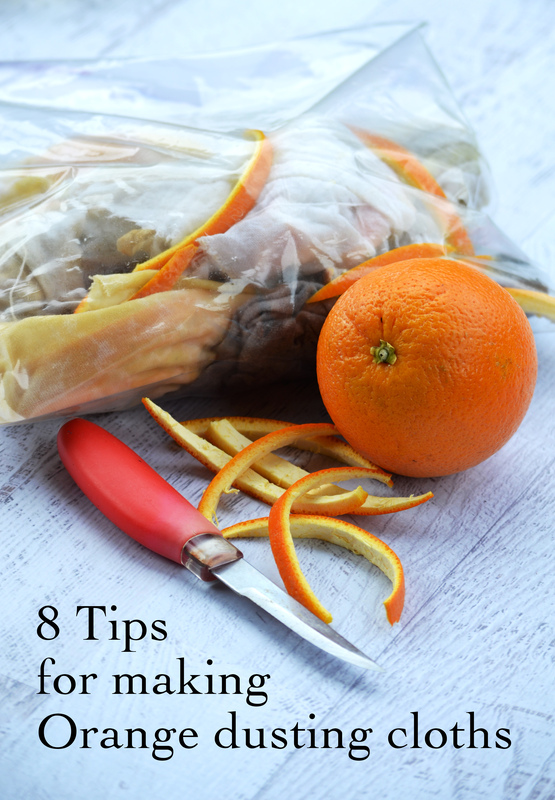 If you step away from your job for a while, wrap the roller in a plastic bag so you can re-use. 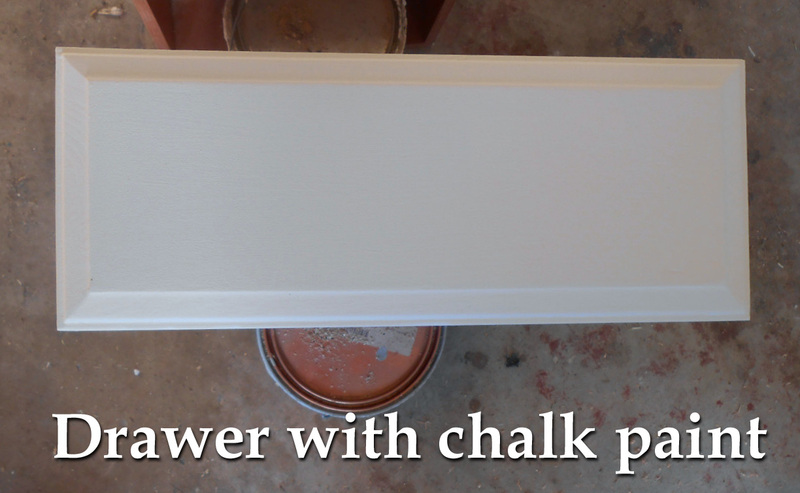 If you will be gone for over two hours, put the plastic wrapped roller in the fridge to slow down paint drying. 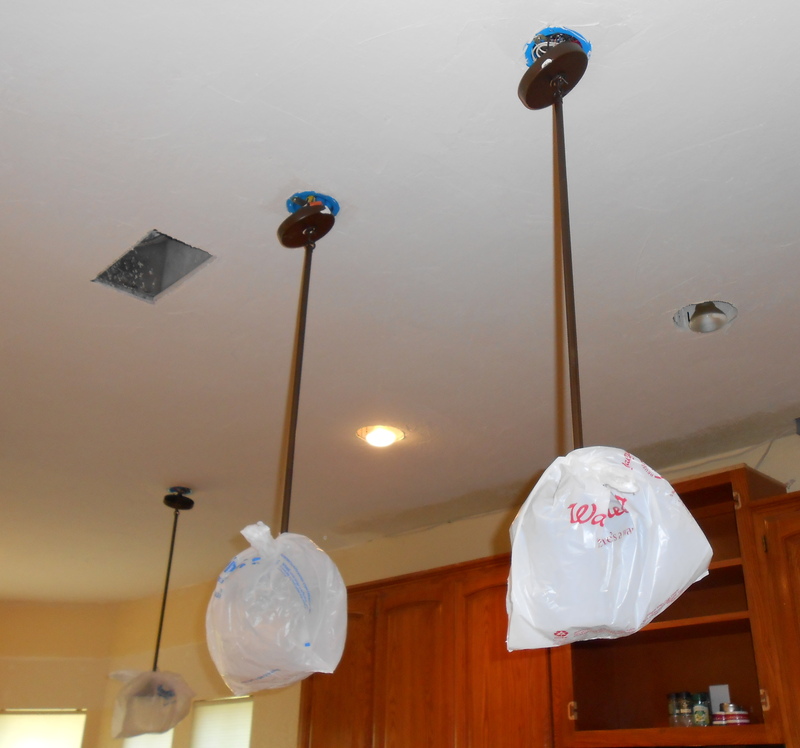 A paint roller handle that has an extension is necessary for doing ceilings. Without it your back will start to hurt. 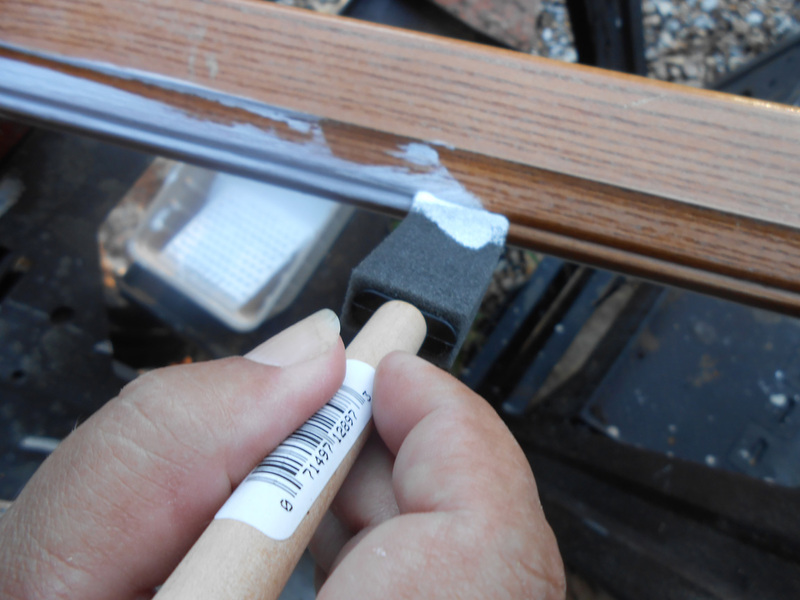 I bought a paint roller screen which sits down into your 5 gallon bucket. 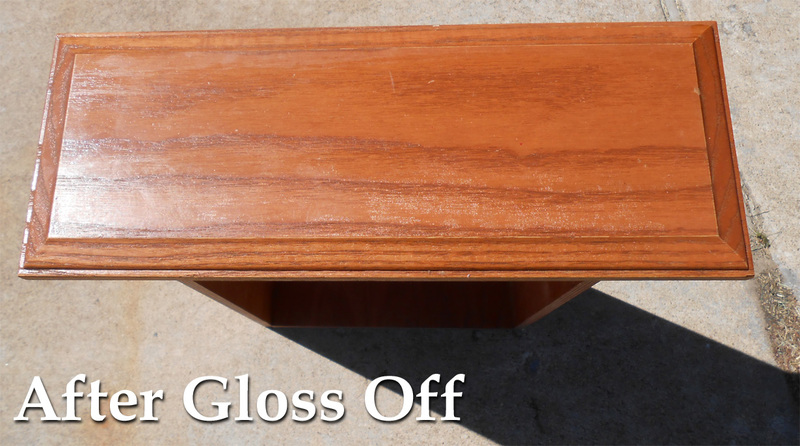 This removes the need for a tray or pouring out paint into a tray so the job goes faster, it wastes less paint and the jobsite remains neater. 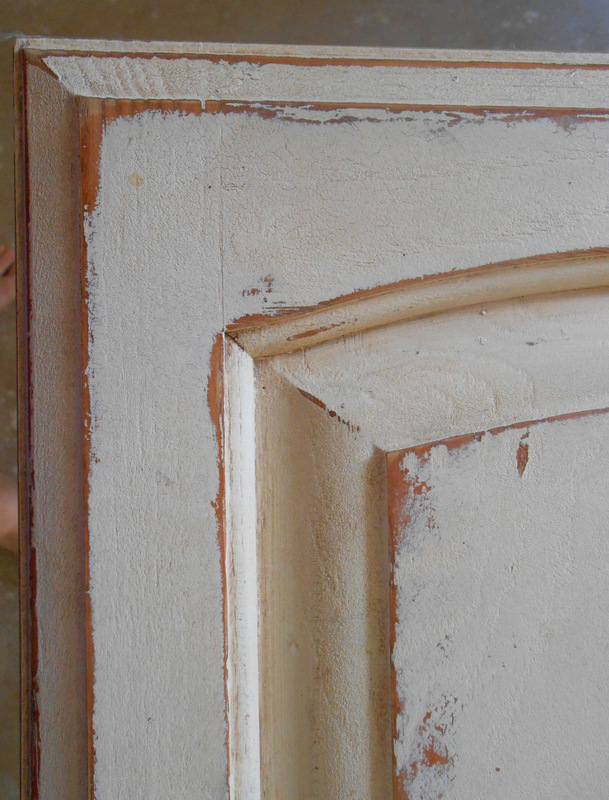 When planning the amount of paint you will need, if painting over fresh plaster (which we did) consider that you will use half again as much paint. For example, the ceiling would probably normally take a gallon and a half; I planned on using two gallons at least. 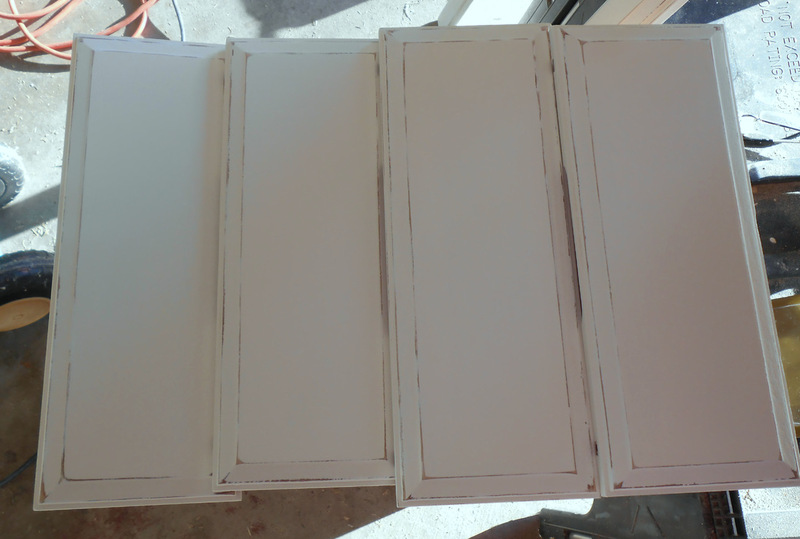 For the majority of the house, I used a simple white flat latex ceiling paint. That way I could extend the paint and anything left over could be used in any room. However, for this room I will be choosing a color. When I used to watch Christopher Lowell’s show, he always recommended painting the ceiling of a room a color. I would pick two complimentary, but different colors and the ceiling was always too obvious. I mean your eyes would zero in on the ceiling and that wasn’t where I wanted the eyes to go. Martha Stewart also paints the ceiling of rooms a separate color then the walls. She does it in this matter: Room A has Color 1 on the walls, and Color 2 on the ceiling; then the adjoining room would have Color 2 on the walls and Color 3 on the ceiling and so on. This was profiled in one of her magazine articles yet, all of this seems overally complicated to me and means more colors you have to deal with in your design. 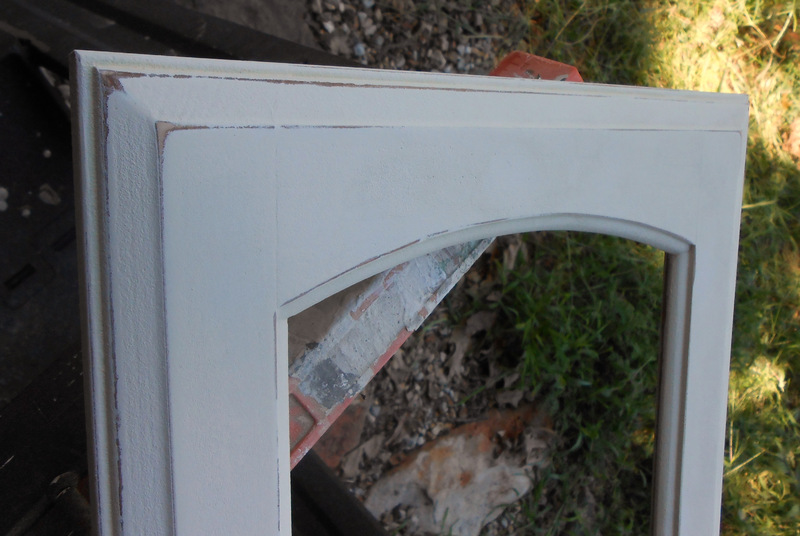 More colors also means more paint left over and increased costs. OTOH sometimes a white ceiling doesn’t do it for me, especially in a room which has a high ceiling. 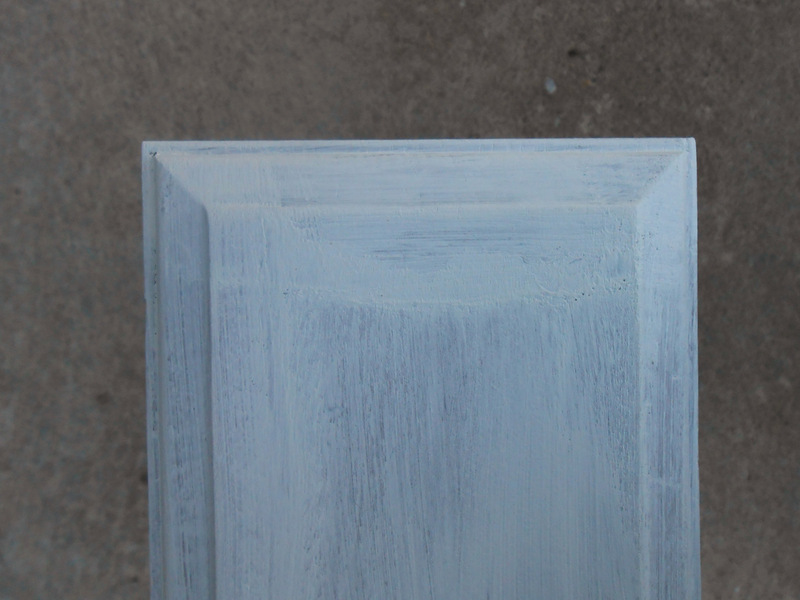 For example, in the powder room, I painted the ceiling a silver. It’s so high that the color is not oppressive which it would be in a lower ceiling room. Because the kitchen has a high ceiling, has a lot of views while you sit in the breakfast nook to eat, and I will be installing white crown molding, I wanted to paint the ceiling a color other then white. 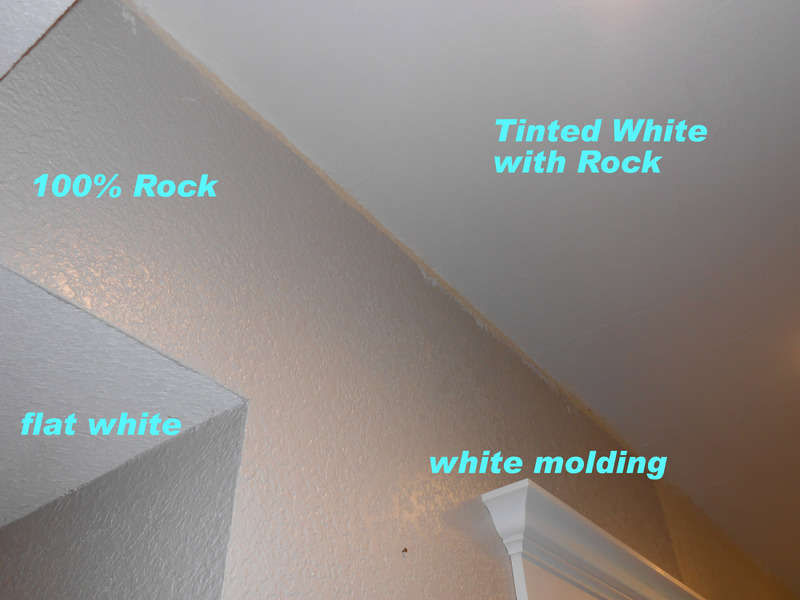 Over the years of experimenting, I decided that what I would do is take the wall color (Rock) and use some of it to tint white flat ceiling paint. It would be substantially lighter in color then the wall, but would not be white, and the colors would automatically compliment each other. 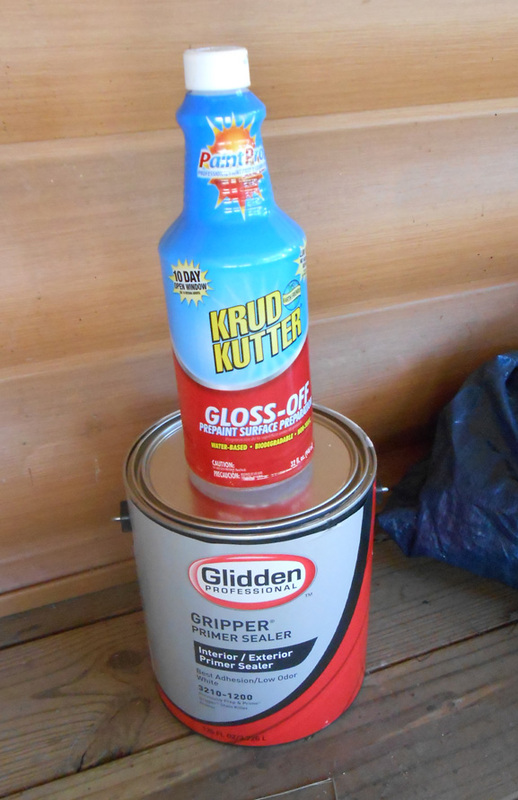 To start with, I got two large, clean 5 gallon containers ($5 each at Lowes), two gallons of flat white ceiling paint (about $22 each), and I had a quart of Valspar’s allen + roth Rock ar720 (Lowes) leftover. Rock is the color all the downstairs walls will be painted in order for the downstairs to appear bigger for sale purposes. I poured both of the two gallons of white together, and hand stirred. Then I added the Rock color gradually. Stirring and testing the color on the walls. 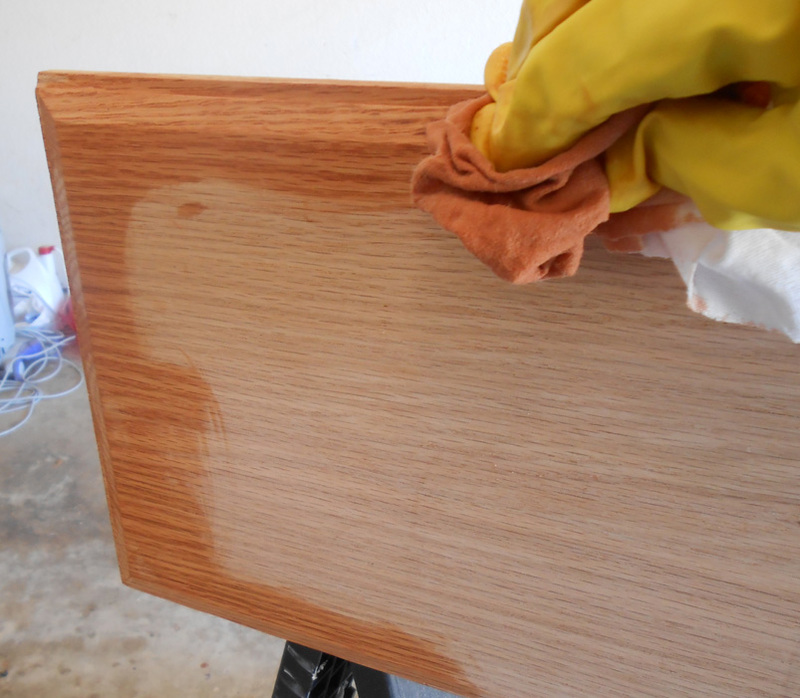 Depending on how picky you are with this you may want to make a bigger patch area and let dry before proceeding with adding more color to your white base. If you get it too dark, it’s very hard to get it lighter again while it’s easier to keep darkening the white. 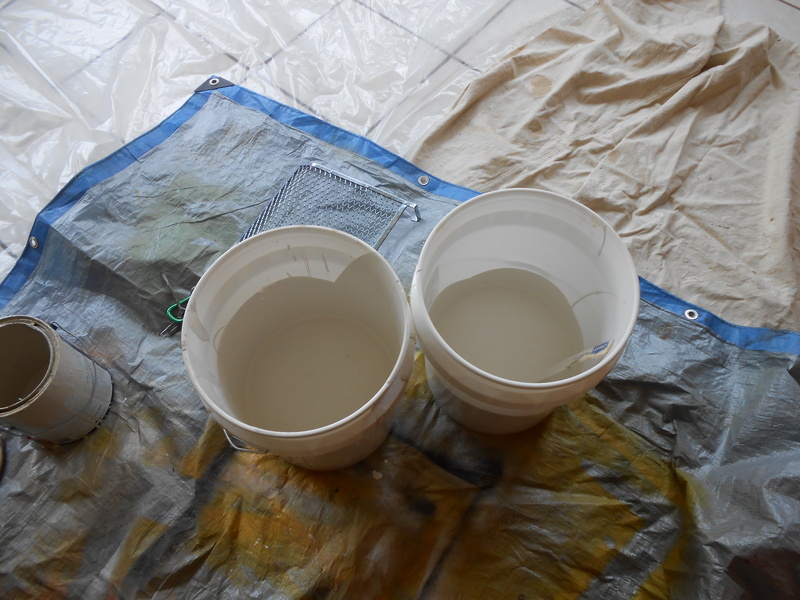 For my purposes, I wasn’t that picky so used about a quart of Rock to two gallons of white. TIP! ~ If you were mixing more then two gallons I suggest you get a paint mixer attachment for your drill to ensure thorough mixing. Then I pour out about half into the second bucket, hand stir again, and then pour back to the original. 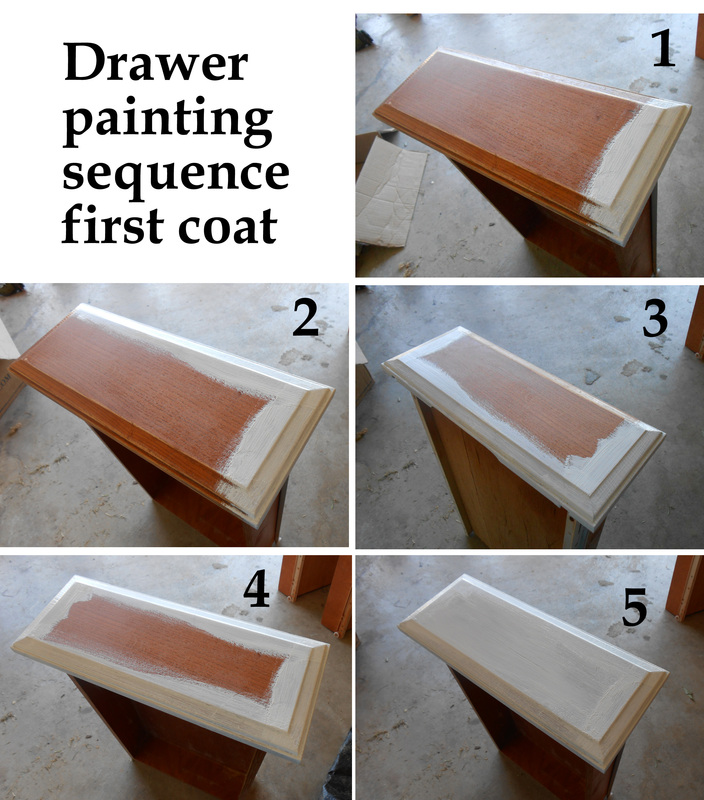 Mixing paint in this manner should be done if you will be using more then one gallon of the same paint color in a room. 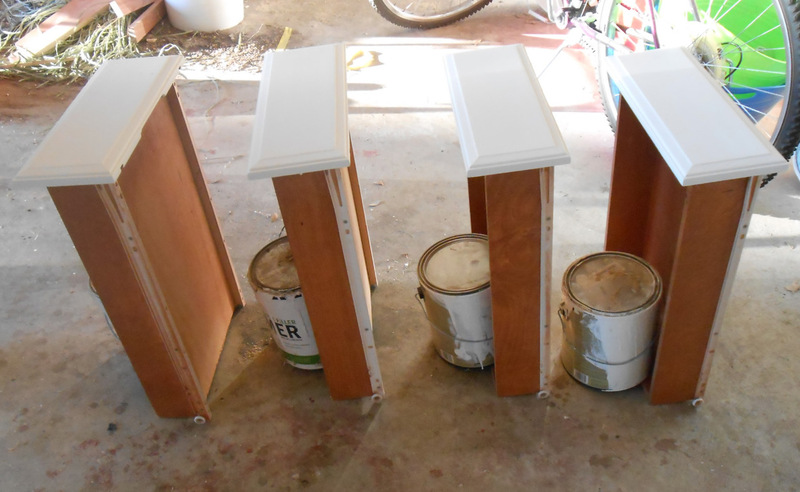 For example, the family room will take three gallons of paint – I will mix all of them together to ensure the color is even throughout the painting process. TIP! 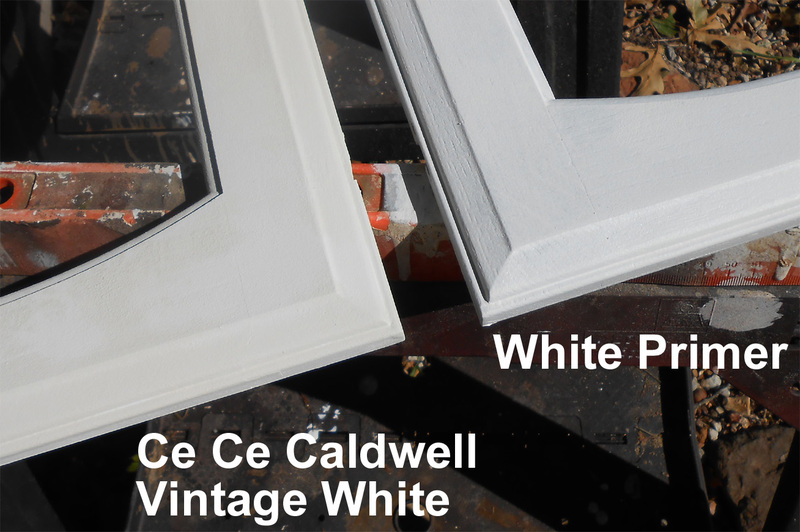 ~ Even if the paint is bought from the same store, at the same time, with the same product color and brand, slight variation can exist between cans. 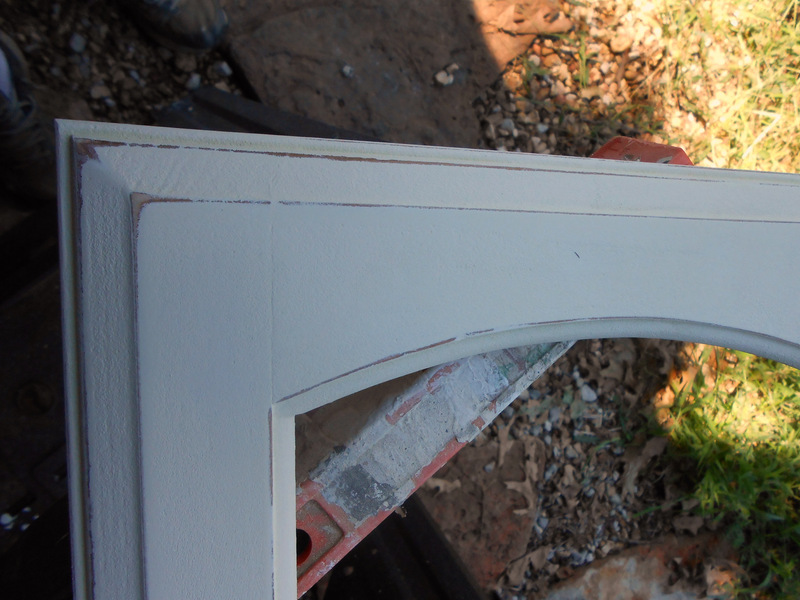 This variation will be blatantly obvious when applied to the walls or ceiling. Mixing the cans will ensure you don’t end up with streaks. 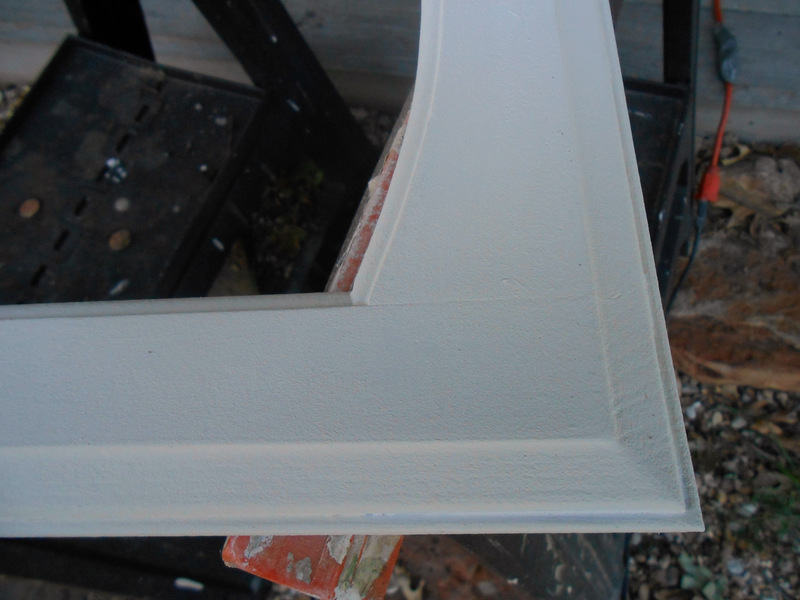 If using a custom mix, always, ALWAYS have enough paint on hand to finish the job. 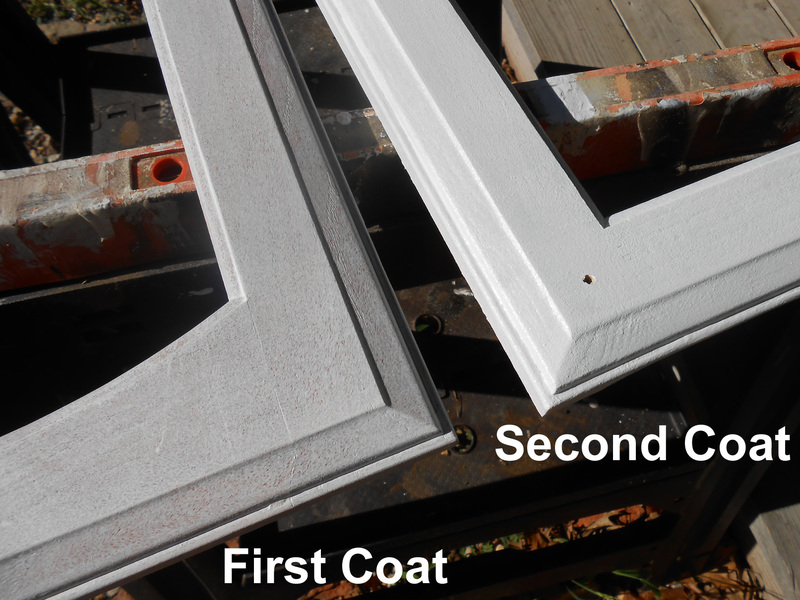 If you run out of a custom mix in painting a large flat area such as a ceiling you have no where you can conceal a break and change in paint. For example, when painting walls, you can switch to a new gallon of the same color at a corner but that isn’t true of a ceiling. And expecting a color match to be accurate on a custom mix is simply not going to happen. While the job isn’t quite finished, and it’s hard to take a photo showing the proper color on the ceiling here is a bit of how the colors are working out. 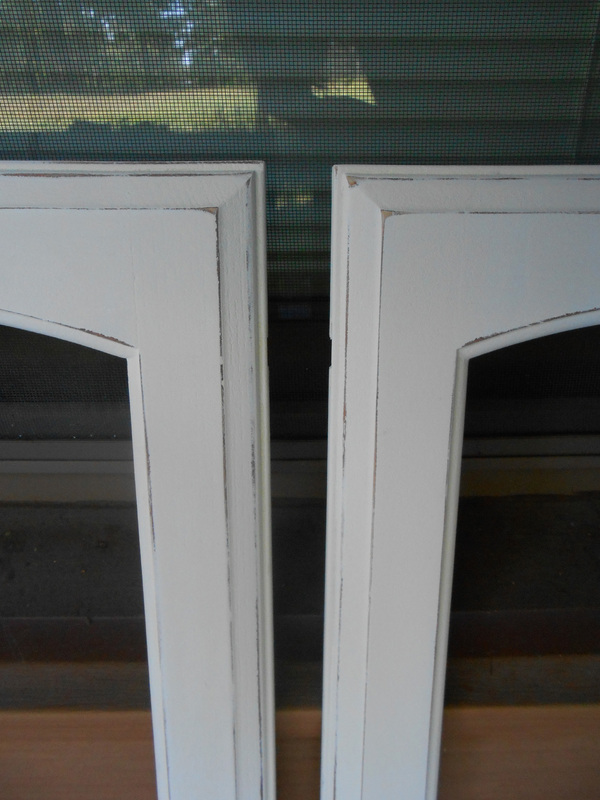 Between the ceiling and wall will be crown molding painted the same white as the door trim. 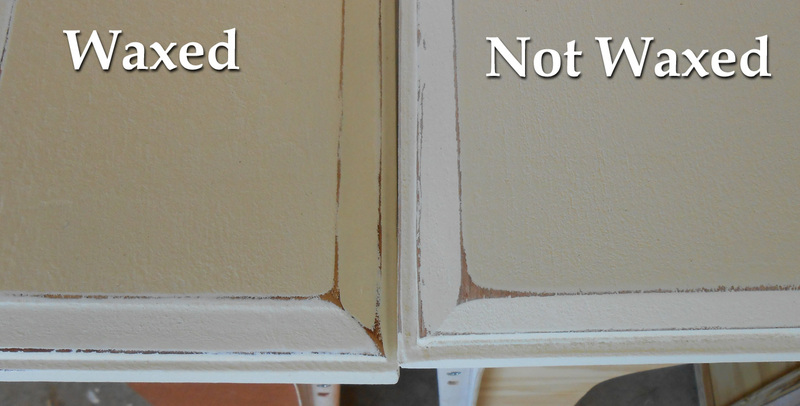 This was another reason I wanted a color on the ceiling – the white between the two will have a sharper definition.